60s Rockabilly, Retro VLV Party Clothing Patterns - JR. MISSES' & MISSES' DRESS. 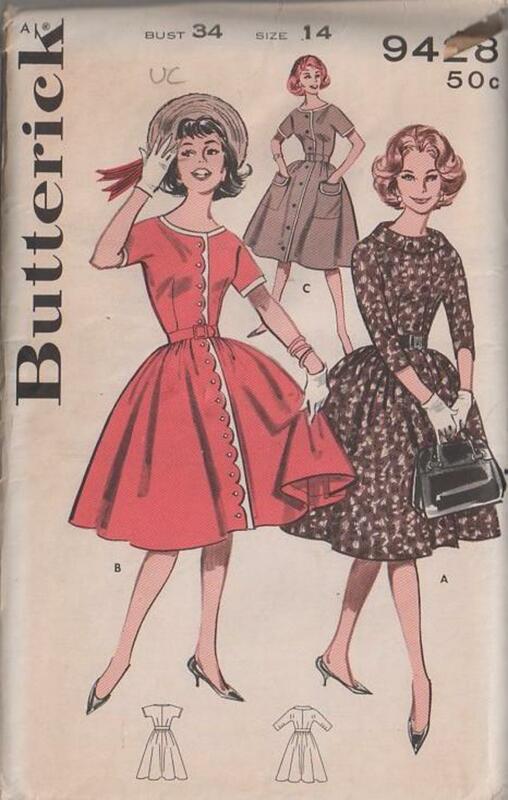 Button-front dress with flared, shirred skirt; sleeves cut in one with bodice. (A) Stand-up two buttoned collar, three-quarter sleeves, purchased belt. (B) Contrast trim on bateau neckline, short sleeves, and scalloped front; self-belt. (C) Contrast trim on bateau neckline, short sleeves and front; contrast bound patch pockets; self-belt.